Electric heated clothing is becoming very popular. With constant improvements to battery life and technology, it only makes sense we’d look for more efficient ways to handle the cold. Electric heated gloves are one of the most popular pieces of wearable tech that makes outdoor activities much more enjoyable. Whether it’s skiing, snowboarding, fishing, or just shoveling the snow or walking, heated electronic gloves can keep your hands and fingers warm in the harshest weather. Having warm hands is especially important when riding motorcycles. Feeling the cold and freezing wind when riding your bike in winter can be profoundly frustrating. Cold weather can really take the fun out of it, and electric heated gloves for motorcycles are possibly the greatest invention for dedicated bikers, especially if you don’t have heated handles. What are electric heated gloves? 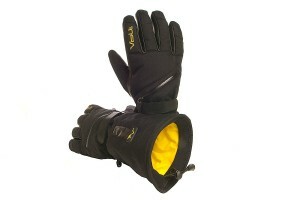 Electric heated gloves are battery powered gloves with special wires in the linings which heat up and generate warmth. Battery types, heat generated and other features depend on each product. Volt Tatra gloves we’re looking at today for example work on rechargeable batteries (charger and batteries included with the product). They last anywhere from 2 to 6 hours depending on heat settings you use. 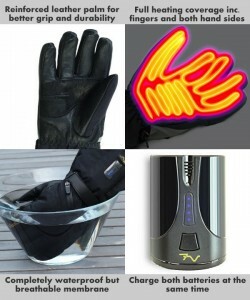 Most quality heated electric gloves will allow you to change heat levels. Higher heat emission of course drains the batteries quicker, but even lowest heat levels are often far better than nothing. 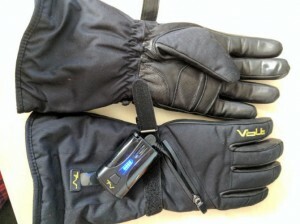 This review is of Volt Tatra heated gloves bought on Amazon and written by Patrick D. Crowe. These gloves work pretty well for their stated purpose. That said, you’re not likely to get over-heated hands (a good thing) but these may not be for you IF you’re looking for something to help your mitts stay warm on a snowmobile for hours on end. I bought these because my new (to me) motorcycle didn’t have heated grips like my last bike. I love to ride and being in Utah means that I have a short enough decent riding season, so I’m always on the lookout for ways to extend that. I was planning a trip and wanted to enjoy it, but the predicted temps weren’t looking promising. Off I went, to find something that would work and require minimum bike modifications! These gloves seemed like an answer to that quest! Nice long gauntlet, thick, and battery operated! Hooray! Ultimately, I didn’t take the motorcycle on that trip, I went by car instead, due to predicted snow and temps in the 20′s. I charged the batteries over night and hooked them up the next morning. They have their little battery pocket on the back of your hand, up the gauntlet with a small, clear plastic, window so you can see what ‘strength’ they’re heating at (4 lights, 4 being the most). To use these batteries, you simply hold the button down to power them up. They start at 4 lights, and right after starting, you can press the button once to take the power down by one light until it’s off. If you power it up and wait a moment, you’ll need to press-and-hold the button to drop it a notch. If you look at the lights carefully, you’ll see them dim slightly, which means it’s ready for you to press-and-hold again to drop it down another notch. Just pressing-and-holding doesn’t turn it off or drop them down one notch at a time, you have to pause slightly (looking for the dimming) between presses to get it to drop one light until they’re completely off. My first trip with them was a short 25 mile journey around the valley, at highway speeds for 2/3 of the trip, with outside temps in the low-40′s. Since it wasn’t real cold, I set the battery at ’2 lights’ and set off. They performed very well at those temps for the 30 or so mins I was out. No coldness seeping in or anything. Since they’re so thick, I wondered if they were heating at all, or if my hands were just staying warm via insulation, but my wife told me that they were definitely heating after trying them on when I got back. The next trip, I decided that I needed to find a baseline for the performance of these gloves. So, the following Monday, with temps in the high 30′s (37-38), I figured I would wear these on my commute (45+ mins, 60 – 80 mph for 85% of trip) with no heating at all. At the lower highway speeds (60-ish), they did pretty good, keeping the cold at bay enough where I could feel they were getting ‘cool’ but not really penetrating. At Interstate speeds (75+ mph) though, well… That portion of my commute is a bit more than half my trip and by the time I got to the end, I was happy to stop! They kept me from getting frostbite, but it wasn’t comfortable from about halfway into my journey to the end. But I got my baseline! Temps for the trip home got into the high 40′s, and not wanting a repeat performance (once is quite enough), I powered them up to ’2-lights’ again and they kept my hands warm enough for the trip home. For me, I don’t want ‘hot hands’, it’s sufficient to have ‘room temp’ hands; not too cold, not too hot… In the mid to high 40′s, the trip home (same route) my hands stayed comfortable! The next morning, the acid test: temps were in the mid-30′s, and I wanted to see if these gloves would keep those temps at bay, at highway speeds! 4-lights (full power!) and we’re off! These gloves did very well, though my fingers were starting to get cold, on the tips, by the end of the trip. Just a quick reminder, that these gloves were fighting the wind-chill effect of 75+ mph with a static air temp of 35 degrees, meaning the chill temps were well below 10 degrees and they still fought those temps off long enough for me to complete a 45 min journey. The trip home was high 40′s again, so I lit up 2-lights, and they performed the same as the day prior. I can’t speak to how long they last, since it’s only been those short trips, but I’ll update when I’ve done some time with them on high! I purchased the XL gloves because I didn’t want a lot of space in them and that size fits perfect; snug without being restricting! So, size-wise, they’re great and I’ll be keeping them just for that alone. The added benefit of the heating will be nice on those cold rides, but I’m not sure how well they’ll do for hours-long trips. Time will tell. I you have need for something to keep your hands warm for shorter trips (> 1-2 hours), these should do you well. Longer journeys? You may want to invest the time and effort to wire up your rig and go with something more powerful. If you’re interested in Volt Tatra electric heated gloves you can purchase them on Amazon, or find more reviews and information here. Heated gloves are a must-have for any serious motorcycle rider, and they work even better if you also have heated bike handles.